When a friend or relative is going through a hard time, or is about to attempt something new or challenging, a little gift of encouragement could really make a difference. 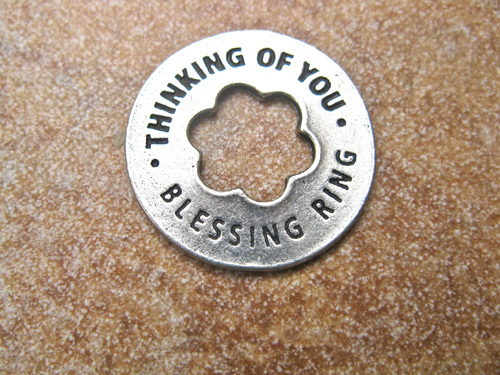 This 'Thinking of You' blessing ring would make the ideal gift to help them and show them you care. Detail: The reverse side of the token says "AlLWAYS". It is made from lead-free, cadmium-free pewter that is certified safe. . . make someone feel really special with one of these little tokens. Comes gift-wrapped, like all our presents - and we can print a personal message on your behalf. More information about tokens of belief as gifts of faith . .